She works late every night, and pulls long hours. This particular morning she left home at 5:30 to make sure she got in to prepare for the big meeting. She left at 8 that night to go home. As she wistfully told me that story, that first statement about wanting somebody to say “thanks” caught my ear. I have a granddaughter named Peyton She is 2-years-old and is learning to talk. She stayed with us a few weekends ago, and her favorite phrase now is “THANK YOU.” As she followed my wife and I around the house, everything we did together came back with those two words. Thank you! These are welcome words to all of us. A thank you communicates that we are valued and appreciated. Not receiving a thank you suggests that you are taken for granted. That is why an expression of thanks can make all the difference in a business relationship. We were all taught as youngsters that when someone does or gives something, we always say thank you. Those two words carry a lot of weight if you are a leader. Those two words are the most powerful words in your leadership tool kit. So my question is this: if your parents stressed the thank yous at an early age, what happened as you got older? Did you forget, or did you just become so jaded and worn out that you forgot the pleasantries? Such pleasantries — such as a “good morning!” with meaning and “how are you?” — are pretty basic. There is no need for a book on leadership or a seminar on being a great leader if you can’t pass that simple benchmark. If you can’t get that right, you should be sent to the back of the line to start over again. Managing people is not rocket science. If you have ever had a bad manager and you were repulsed by some of the things that they did, why would you repeat it? The best leadership training, however, is to work for someone that is ill equipped to be a manager. That is a daily, eight hour seminar. I often wondered how they would respond if the people they were dealing with was one of their loved ones. When I worked in training and development for IBM, one of my trainiers said that sometimes she would lose patience and become rude when she had someone in her class that just did not get it. My response was, what if I had your mother or father in a class and I was rude to them? Better still, what if your mother were in that class you taught? That brought no response — but I did see the lights go on. Everyone we interact with is someone’s daughter, brother, mother, or father. If you would want them to be treated fairly and with respect, then you pay it forward. 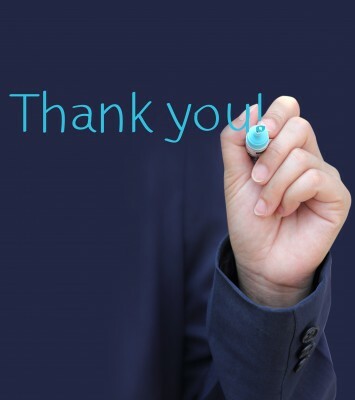 The thank you primer: Here are some tips you can use to develop the profitable habit of saying “thank you” to your customers, employees or whomever you deal with. Be specific in your thanks. Do a thank you that will be remembered. Be as specific as possible. Make it like Velcro. It’s OK to say, “thank you for everything,” but why not get specific and say, “thank you so much for taking charge of that project. I know that you came in early and stayed late throughout. I appreciate it very much.” My value walk away: be specific, detailed, and say why. Step back in time. The handwritten note is a tool that should be used more often. I was told by someone that had just received a job offer that she found out that the hiring manager felt that both candidates came up about even. However, my friend took the time to write a beautiful thank you card to the hiring manger, and that was what made the difference. Why is the thank you note so powerful? I think that as technology has taken over our lives, people are increasingly starved for the personal touches like handwriting notes or thank you cards. People used to be a lot more polite than they are now. If someone forgot a “please” or a “thank you,” it would have been considered extremely rude. Today’s world is a lot different. We have all been to stores where the cashier didn’t say a word and barely acknowledge your presence. We have all, in some way, encountered rude behavior like this. My antidote is to say “thank you” to someone when it should have been the other way around. Sometimes, the person who should have said thanks will catch themselves and respond accordingly, although there are some that will never respond. While there’s not much we can do to change the behavior of other people, there is a lot we can do by being good examples ourselves. Always pay it forward is my motto. So if you are leading people in an organization, I ask you to remember what you were taught as a child. My good friend, China Gorman, told the story that she would always keep thank you cards at the ready and would use them to send a quick note to people within the organization that she had interacted with. So this week, just remember your manners and what your parents drilled into you.